A natural organic acid which occurs in many foods. 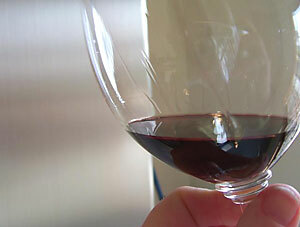 In wine, it exists only in trace amounts unless the wine has undergone a malo-lactic secondary fermentation. Landwein - German equivalent of French vin de pays: Trocken or Halbrocken wines of a higher quality than Tafelwein and produced in a specific region. There are 21 regions for Landwein (Landweingebiete), which partially correspond to the regions or subregions for Landwein. Name given to dessert or full-bodied table wines produced from overripe grapes. (Late refers to time of year, not time of day). The acute angle between a vine shoot and a leaf stem or petiole extending from the shoot. Buds develop in these axils or "crotches" just above each leaf petiole. A virus disease of grapevines in which the virus infection seals off the leaf petiole (stem) so that the sugars produced by the leaf through photosynthesis cannot be transported back into the vine. The leaves tend to curl downwards at the edges as the sugar accumulates. The leaf, in an effort to get rid of a problem, uses it to make red anthocyanin pigment and the leaf is seen to turn red as well as appearing rolled. 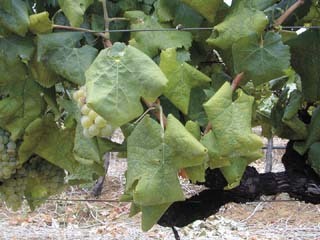 Vines infected by these viruses have difficulty in ripening their fruit because much of the sugar the vine produces cannot be used by the vine where it needs it -- in the fruit. Leafroll may not be a serious problem in varieties which ripen early but are grown in climates which provide a longer than needed season. But when the opposite is true, where the variety just barely ripens under normal conditions, then the infection by leafroll virus causes the crop never to fully ripen, with disastrous results to resulting wine quality. A bottle of wine which has wine oozing or slowly dripping from the cork (as opposed to the more or less normal occurrence of the cork being mostly wet but without noticeable loss of wine volume). The sediment which settles to the bottom of the wine in a tank during processing. If primarily yeast, as from a fermentation, it is called "yeast lees;" if sediment from fining, it is called "fining lees." Wine appreciation term referring to the colourless "tears" which continually form along the inside wall about an inch above the surface of wine in a wine glass. Tears are formed more readily by higher alcohol wines than by lower -- the cause being related to alcohol content, its volatility, the lower volatility of water, the relative densities of alcohol and water, surface tension and the law of gravity. I don't think you want to know any more than that. This used to be Germany's most exported wine, which is sweet, inexpensive, and generally looked down upon by connoisseurs. This wine's origins go back to the sixteenth or seventeenth century. The word Liebfraumilch, which means "milk of Our Lady," was originally used only for wines produced from the vineyards of the Liebfrauenkirche ("Church of Our Lady"), a church in the city of Worms in Germany's rheinhessen region. Over time, the word Liebfraumilch began to be used for any wine made in the Rhine region. In 1971 German law established specifications (which were modified in the 1980s) for calling a wine Liebfraumilch. Today, in order for a wine to be called Liebfraumilch, it must meet the following provisions: be a wine "of pleasant character"; contain a minimum of 18 grams of residual sugar (1.8 percent); be made only from müller-thurgau, sylvaner, kerner or riesling grapes; be of QbA quality; not be labeled with Prädikat designations such as spätlese or auslese; and come from one of the four German regions of rheinhessen, pfalz, rheingau and nahe (in practice, almost all of it comes from the Rheinhessen and the Pfalz). As with most wines, the quality of Liebfraumilch can vary dramatically from producer to producer. A sweet wine such as a sweet spatlese. (see Blaufrankisch above). this is the same red grape variety as the Blaufrankisch in Austria and the Kekfrankos in Hungary . It is late ripening and can produce wines that are full and fruity. Also known as the Blauer Limberger or Lemberger. Wines made from this grape reportedly have low levels of histamines. It is the normally higher amounts of this compound found in many other red wines that can cause allergy headaches in some people. Standard volume of measure in the metric system (used throughout the world for wine).